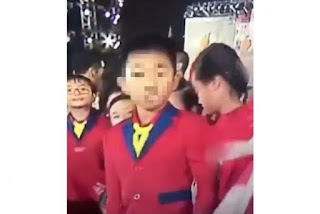 SINGAPORE - A pupil from Henry Park Primary School who was caught on camera making a rude gesture at the National Day Parade (NDP) on Wednesday (Aug 9) is "deeply apologetic" for his action and has been counselled, said his school principal. "The student regrets his action and is deeply apologetic. The school and his parents have counselled him, and will ensure he learns from this incident," Henry Park Primary principal Chia Soo Keng told The Straits Times on Thursday afternoon. Television footage of the parade had captured the pupil from the school pointing his middle finger at the camera at the end of the show, when performers gathered for the finale. Photos and videos of the boy making the gesture were circulated on social media after the parade. A photo of a man and Mr Chia speaking to the boy after the incident also made the rounds online. About 400 pupils from Henry Park Primary were involved in Wednesday's parade, which marked Singapore's 52nd birthday. They had hand-signed to a National Day song, We Will Get There, performed by Singapore's largest disability-inclusive orchestra The Purple Symphony in the fifth act.